It's rare to find a book about guns in the U.S. that doesn't come across as hysterical -- either the hysteria of someone seemingly determined to live up to every possible stereotype of a "gun nut" or the hysteria of someone seemingly determined to live up to every possible stereotype of an out-of-touch wussy liberal. Caitlin Kelly's Blown Away (excerpts available here) doesn't quite live up to the claims on its front cover -- "an unbiased exploration of the right to bear arms" -- but it is certainly the most even-handed and rational book about guns and American gun culture that I've encountered. Matt Zoller Seitz is one of the few film critics whose reviews I will read regardless of what he is reviewing, because even when my taste is different from his (his love of Brian DePalma perplexes me, for instance), his reviews usually make me think about or notice things I wouldn't otherwise. I've just returned from a week in New Hampshire, which is why things have been quiet around these here parts. 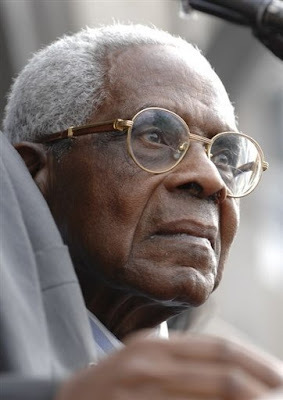 Via Pierre Joris's blog, I just learned that the great writer and politician Aimé Césaire has died. I didn't pay much attention to Césaire until grad school, when one of my favorite teachers (and later one of my thesis readers) was Keith Walker, whose particular specialty is francophone literature and whose particular interest is Césaire. His passion transferred to me, though I can't read French, so I've been stuck with the few English translations of Césaire's many works. Last year, I used Césaire's play A Tempest and excerpts from his Discourse on Colonialism in my AP Lit class (to go along with Shakespeare's Tempest), and I would do so again in a heartbeat, because it blew the kids' minds (in a good way). I'm glad to see that the desire to come up with stable definitions and labels for difficult-to-define-and-label things exists not only within the science fiction community, where the desire for taxonomy seems sometimes pathologic, but also within the world at large. Exhibit A: The Queen's English Society is demanding that poems be defined as things with rhyme and meter (or, rather, metre). Those of us who have survived interminable discussions of what, exactly, makes something science fiction or fantasy can probably help our friends at the Queen's English Society. In fact, we can let them know that the desire for definition does not end with one term. Oh no. One of the great laws of the universe is: Taxonomy breeds taxonomy. Once we have one label or category, we need many. And then the many need many of their own. 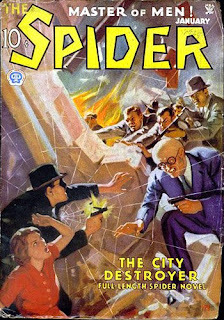 The column has some links to various sites of information about The Spider, but if you're curious about where to procure some of the stories, the best source I know is The Vintage Library, which sells books (including all 8 Carrol & Graf editions for $20), pulp replicas, and electronic editions. 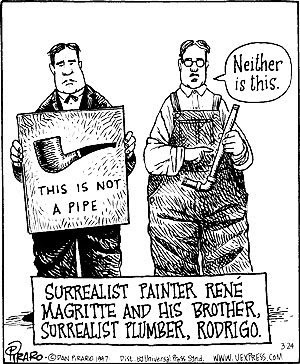 Those old pulp writers, Doc Smith, David Keller, Edmond Hamilton, Murray Leinster, Seabury Quinn, Lovecraft, Otto Binder, Jack Williamson, and all the rest of that crowd -- were writing the best they knew how! Their ideas might seem elementary, their technique primitive, to us. But to themselves and their contemporaries, the ideas were fresh and startling, the technique the most advanced they were capable of (and very likely the most sophisticated their readers were capable of assimilating). 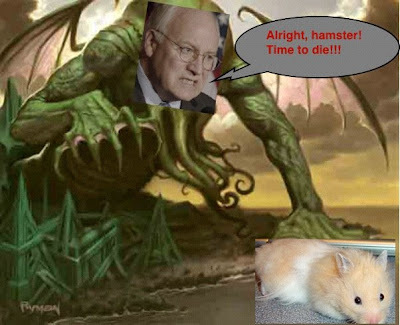 Even the Old Ones Say "Alright!" I want to see them die!!! I'm even bringing my (extended) family into this! Say it one more time: ALRIGHT!!! *Yes, John says God only pokes hamsters in the rear end when we use "alright", but here he is not being entirely forthright with us. "A poke from God" is a well-known phrase used by certain secret societies and cabals to indicate a particularly painful form of torture that leads to death. Just ask somebody at the Creation Museum. They know about pokes from God. Chris Barzak has just posted the announcement that he will be joining Delia Sherman in editing Interfictions 2, which picks up where Interfictions: An Anthology of Interstitial Writing left off. Loath as I am to disagree with John Scalzi, I must note a difference of opinion with regard to the word "alright", which John proclaims is not even a word. And he thinks it's ugly. Whether it is ugly is a matter of taste, and I shan't argue that. Whether it is a word, though ... well, it's definitely a word, since it has boundaries and is used to convey meaning, though I will grant that most American dictionaries of English do not accept it as part of formal, standard English yet. which is a group pulling together information on the personal libraries (some in progress, some complete) of various famous dead people. For instance: James Joyce, Karen Blixen, Danilo Kis, Sylvia Plath, Walker Percy, Ezra Pound, Robert E. Howard, and Tupac Shakur. I'm pleased to announce that the guest editor for Best American Fantasy 3 will be Kevin Brockmeier. The book will be filled with stories from this year (2008) and will be published in September 2009. For the full, official press release (with a rare quote from series editor Matthew Cheney himself! ), check out the BAF blog. For information on guidelines and publicity, see the BAF website. I'm really thrilled Kevin agreed to join our endeavor -- I can't imagine a person who would be more perfect to take over. I'm also thrilled that I was able to convince Ann and Jeff to stay on and help with some publicity and packaging, because there's a lot I still don't know about putting books together, and their experience and knowledge and patience have been essential to the series. I've tried to write about Lydia Millet's new novel, How the Dead Dream, a few times now, but I've never been able to get too far. It is one of those books that, for me at least, is so entirely what it is that writing about it feels inadequate, because I can provide little more than summary or illustration, and if that is all there is, then I might as well keep this short and say no more than I liked this book. But I'm going to risk saying a bit more than that. As anyone on whom I foisted it knows, Millet's previous novel, Oh Pure and Radiant Heart, was one of my favorites of recent years. I had no trouble saying lots about that book; if anything, I had trouble shutting up. How the Dead Dream is an entirely different sort of book, though. It is less vast, less epic: the novelistic equivalent of a lyric poem or a cello suite.